Dual Mass Flywheels - Resurface, Replacement, or Conversion? 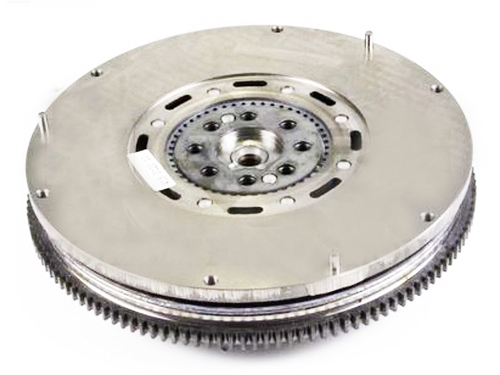 When it comes time to replace your clutch, it’s a great time to consider the health of your vehicle’s flywheel. Should you scrap it and get a new one? Is resurfacing an option? Or maybe this is a great time to convert to a single mass flywheel if you were already thinking about it. Here are your flywheel options when it comes time to make the choice. Dual Mass Flywheels can NEVER be resurfaced. Grinding grit can and will get into the internal parts and quickly destroy the flywheel once it is reinstalled and in use. You must either replace the flywheel with a new Dual Mass Flywheel or, if the option is available, convert to a single mass solid flywheel replacement. If your vehicle has remained stock and you do not tow heavy and regularly, and the original dual mass flywheel has lasted over 100,000 miles, then go ahead and replace the dual mass flywheel with another one. If you have chipped the engine or performed other modifications, or if you tow heavy, or if the life you got out of the original dual mass flywheel was poor, then if a single mass solid flywheel conversion option is available, now would be the time to do it. While there may be a few general issues with the single mass flywheel, Phoenix Friction has addressed these issues with our conversion flywheels. For diesel pickup truck applications, adding a thicker additive to the transmission case reduces the gear rollover noise. Staying with a single disc design reduces flywheel inertia and also reduces the resulting strain on the transmission and drivetrain.